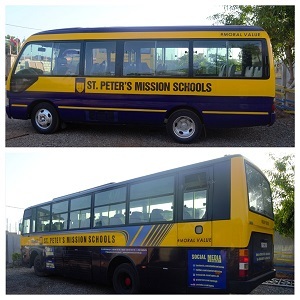 The School provides a transport service for its students both in the mornings and afternoons. There are five school buses covering four major routes, namely Adenta, Nmaidorn, East Legon and Haatso and their immediate environs. A number of students patronise this service going for either the 'full price' option in which they use the bus in the morning and in the afternoon or the 'half price' option when they want to board the bus only once a day.